The Creekview High School students won first place at the 2018 Teen America Rocketry Challenge. 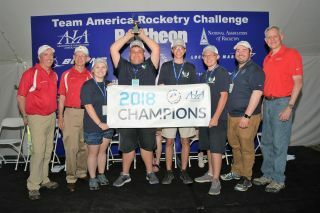 Here, they are celebrating their win with officials from Raytheon, the National Association of Rocketry and the Aerospace Industries Association. High school students from Georgia's high-flying, egg-toting rocket team will soon represent the U.S. in an international competition. On May 12, the Creekview High School aeronautics team won first place at the National Fly-Off for the Team America Rocketry Challenge. The students, who are 17 and 18, designed and built their own rocket which they used to compete against teams from across the country. The Georgia team, sponsored by Raytheon, will compete on the international stage against other national winners in London on July 19-20. This is the 16th annual Team America Rocketry Challenge (TARC), and more than 70,000 students have taken part in the competition over the years. This challenge encourages students to engage in science, technology, engineering and math (STEM) activities and even pursue careers in STEM fields. In addition, the competition has encouraged more girls to get involved — this year, there were 12 all-girl teams, and girls made up one-third of the approximately 5,000 students who participated in the challenge, according to Raytheon. A rocket can be seen launching at the 2018 National Fly-Off. The Creekview team, led by coach Tim Smyrl, was excited to participate and beyond thrilled to have won, the coach said. Winning this competition is "the best feeling I've ever had in my life," team captain Brayden Dodge told Space.com. Teammate Kennedy Hugo added that "we were just trying so hard to qualify," so they were amazed to end up first. The students joined the aeronautics team for different reasons: Team member Warren Teachworth said he was intrigued by flyers posted at school, while Brayden noted he was inspired by his older brother. Kennedy said that the team's coach persuaded her to join after noticing her involvement in archery. Aden McChesney is also a part of this team but was not available to speak with Space.com. Even though the students joined the team for different reasons, they now all have their sights set on STEM-related careers. The team shared with Space.com how nervous the national competition made them. They noted that even if they could get their rocket to the correct altitude, and have it return at the correct time, they still had to make sure their eggs landed uncracked. But the win seems to have boosted their confidence for the international challenge, with their excitement overshadowing any nerves, "I think we'll feel less nervous 'cause we'll have prepared," Kennedy told Space.com. They're enthusiastically awaiting the competition, looking forward to meeting the other competitors and being able "to learn more about their culture," according to Brayden. At the international competition, the team will again have to launch their rocket with two raw eggs on board. But, whether or not they take home the title of global champion, the Creekview students have grown tremendously through their experience on the aeronautics team. Brayden and Warren expressed how much they learned working as a team, with Brayden saying that he learned "how to work with other people and be able to delegate tasks." Kennedy echoed those sentiments, saying that they learned "to be able to communicate and get things done within a team," adding that while she was hesitant at first to join an all-boys team, it has so far been a great experience.